We're trying something new. Saturday's posts will now be written by the rest of the family. I thought it would be good to get someone else's point of view every once in a while. Mattey will start off our Guest Posting Saturdays. For a few nights now I've been talking about having Kade come and sleep with me. Usually he using a feather bed that Mom and Dad keep in their room. But last night he used his old tent. 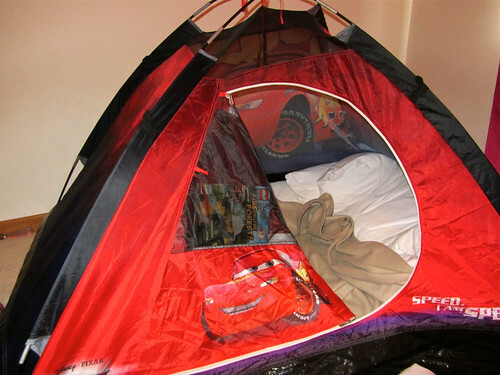 It was my idea for him to put the feather bed inside the tent, like this. Kade said,"It was very comfy. It took me about 10 or 11 min. to get to sleep. "In the morning his cough woke me up at about 4:00 a.m! I thought it was about 7:00 a.m [I don't look at the clock] so we went downstairs and watched a movie. Dad came downstairs and told us to go back to bed.So we went back up to my room. Apparently we did go back to bed because we woke up 7:40ish. Hopefully it will never happen AGAIN!